Sandy was born in Edmonton, and lived in Spruce Grove for 25 years where she raised her 3 boys. She has been back in the big city now for 10 years. 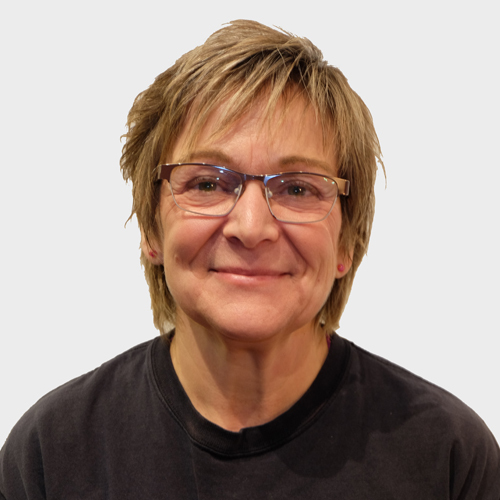 Sandy has been a Dental Assistant for 38 years and still works in the same practice several days a month. After deciding to pursue a career in the trades, she found Habitat Studio in May 2007 and has never looked back. Initially apprenticing as a carpenter, her role grew to that of field assistant. Originally her basic purpose was to keep our sites looking good, clean and professional, but since her position has evolved into a broad range of duties, including taking over some of the smaller tasks that project managers had, allowing them to focus on their priorities. Sandy enjoys being physically active, and especially interacting with each member of the Habitat Team, trades, suppliers and clients.